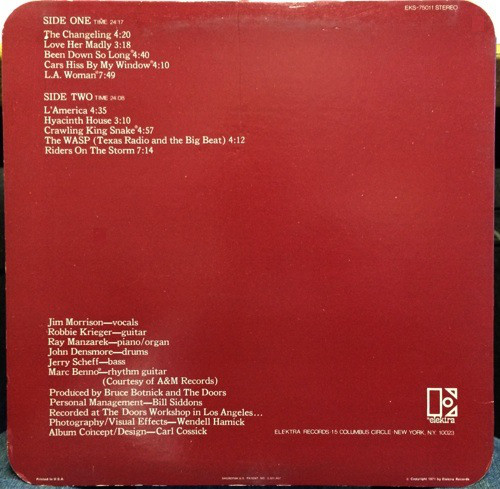 This was the Doors' final album, Jim Morrison died three months after its release and, building on the blues feeling of "Morrison Hotel", it was their most bluesy album. The sound quality, as on all these latest remasters, is outstanding. The opener, "The Changeling" is an excellent, lesser-mentioned Doors song - full of grinding blues rock, swirling organ, great bass and what was by now an increasingly gruff, slightly croaky vocal from Morrison. "Love Her Madly" sounds like the blues meets the early Beatles with a bit of end of the pier-style jaunty organ thrown in. It ends frantically, harking back to the debut album. "Been Down So Long" is an industrial, muscular blues, with some seriously good guitar. 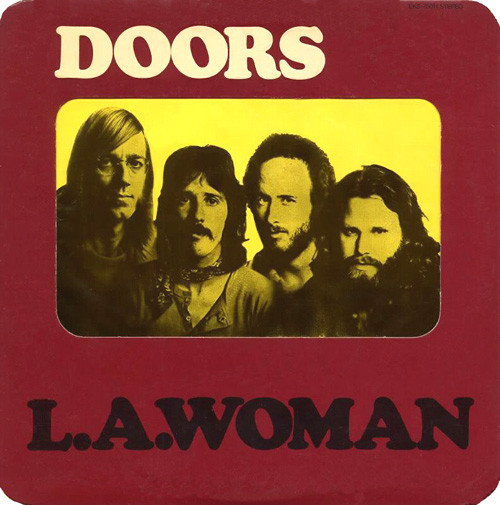 This is The Doors at their bluesy best. I really like this side of them. The slide guitar near the end is quality. "Cars Hiss By My Window" gives us an even deeper shade of blue - slow burning, throbbing bass, menacing atmosphere. Great stuff. The title track is simply wonderful, a slow brief intro suddenly morphs into that classic driving beat that many are so familiar with. It keeps chugging away formidably. Then at the end we get the build-up of the "mojo rising" bit. A true classic of its type. Morrison's vocal is superb. Everything about the track is. "L'America", while still being bluesy in its background instrumentation, has more echoes of the sixties and psychedelia. "Hyacinth House" has a sumptuous guitar, drum and bass intro before Morrison goes into his best namesake impersonation as the verses sound so much like Van Morrison in their melody. Not in his voice, obviously, which is completely different. I just can't get over what a great bass line this one has, and organ solo too. "Crawling King Snake" is back to the blues with its swampy broodiness. The essence of this album is contained in this track. "The Wasp (Texas Radio & The Big Beat)" is probably the weirdest track on the album, blues mingles with psychedelia and bizarre lyrics before the album closes with the last track The Doors were to give us, and what a track. The atmospheric "Riders on The Storm" is a true classic of early seventies rock and a wonderful way to remember this seminal, ground-breaking and highly influential band. If The Beatles had put this out it would have been hailed a work of genius. Still, The Doors garnered much critical respect as well. All these years later and so many are still getting so much pleasure from them.